Ron Salazar, a friend to the Maxwell Street Foundation and to the city of Chicago, passed away suddenly on January 26, 2019. Ron worked for the Department of Cultural Affairs and Special Events (DCASE), and prior to that for the Mayor’s Office of Special Events (MOSE). In his roles throughout that time, Ron was instrumental in helping the Foundation set-up at the annual Chicago Blues Festival and at the New Maxwell Street Market. He encouraged and implemented cultural programming at the Market, and invited the Foundation to participate. Ron, born in 1965, was only 54 years of age. 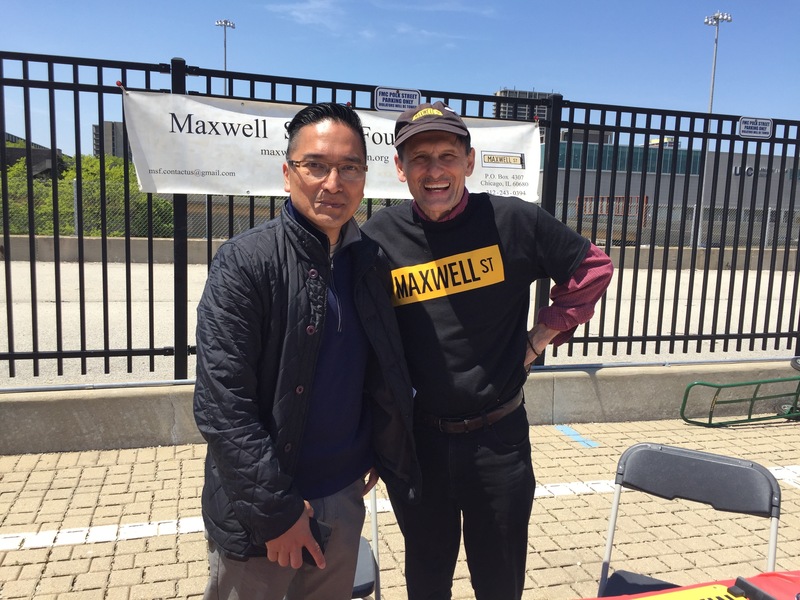 Photo caption: Ron Salazar (left) visits the Maxwell Street Foundation at the Maxwell Street Market, with enthusiastic board member Peter Pero on the right. Photo by Lori Grove, Maxwell Street Foundation, 2017. All images published by the Maxwell Street Foundation within this website are copyright of the artist and are for educational, personal, and/or noncommercial use only. For any other use, please contact gro.n1555619926oitad1555619926nuoft1555619926eerts1555619926llewx1555619926am@of1555619926ni1555619926.